By now, the basics are well known. The mainstream Turkish media was found to be woefully inadequate when it came to reporting the enormous anti-government protests that recently erupted across the country. As Turks took to the streets to confront ruthless security forces armed with gallons of tear gas, pressurized water, tanks and batons, those still at home turned to TV news stations only to find nature documentaries and panel shows discussing liposuction. It’s fair to say that the protests still ongoing across Turkey have not been the Turkish media’s finest hour. In fact, these events – perhaps more than any previously – have exposed for domestic and international observers just how compromised the Turkish media has become. (As many have observed, this comes with a bitter taste for Kurds, who ask why many now protesting did little when the Kurds were complaining about scant media coverage of their own troubles.) Ironically enough, the lack of TV coverage appears only to have inspired more protests. According to a Bilgi University survey among 3,000 young Gezi Park protesters, 84% cited muted media coverage as one of the main reasons for taking to the streets. This also explains the graffiti around Istanbul lambasting the “sold-out” media, the satirical memes circulating like wildfire on the internet, and the NTV broadcast van trashed and overturned in the middle of Taksim Square. As is now well documented, where mainstream media failed, social media stepped in. It is estimated that more than 3,000 tweets per minute were sent about the protests after midnight on May 31; Twitter hashtags telling the Turkish media to do its job were trending worldwide, while CNN Türk was airing a documentary about penguins. This also resulted in large demonstrations being organised outside the Habertürk and NTV offices in the following days, which, in a grim irony, NTV ended up reporting on. Indeed, Twitter became the only place to go to for information (and disinformation) as events unfolded; exposing the enormous chasm that now exists between independent new media and the toothless media corporations in Turkey. While this was no real revelation, (the same happened after the Uludere/Roboski massacre in December 2011, when live tweeters at the scene bypassed and shamed the established media groups), the scale of the awareness that the latest events stirred is unprecedented. Reflecting the government’s frustration at being unable to do much about what gets posted online, Erdoğan described social media as a “trouble” full of “unmitigated lies” (if he was referring to the deluded Twitter ramblings of Ankara Mayor Melih Gökçek he may have had a point). One day later, Deputy Prime Minister Bulent Arınç declared that the government “could have shut down Internet access, but didn’t.” Still, there were other ways for the government to make its point, as 33 protesters were detained in the western city of İzmir for tweets they had posted. CNN International shows live coverage of the demonstrations in Taksim Square, while CNN Türk airs a penguin documentary. Turkey-watchers are familiar with the country’s chronic press freedom problems. One of the root causes is related to the ownership structures of Turkish media companies, which opens them up to political pressure, an issue that Yavuz Baydar repeatedly – and convincingly – returns to. One small example of this which I didn’t see anyone else pick up on came with a report, released in April, by respected think-tank the Turkish Economic and Social Studies Foundation (TESEV), titled “Policy Suggestions for Free and Independent Media in Turkey.” The report was thorough and fair, particularly focusing on the crippling conflict of interest that comes when major media outlets are owned by large holding companies involved in other sectors. Although the report was covered by the Gülen-affiliated Zaman newspapers, no newspapers from the Doğan Media Group (owned by billionaire Aydın Doğan – perhaps Exhibit A of the above problem) – Hürriyet, its English language arm Hürriyet Daily News, or Radikal – mentioned it. With the large media companies so obviously unfit to perform their Fourth Estate function, the focus is shifting to new online independent media. Along with the agenda-setting Twitter, the website T24 has also developed quite a reputation in providing brave, reliable, independent reporting. Veteran journalist Hasan Cemal, for example, after being controversially fired by daily Milliyet, was taken on by T24 and has since written a series of articles based on time spent with the retreating Kurdistan Workers’ Party (PKK) rebels in southeast Turkey, including an interview with military head of the PKK, Murat Karayılan. The Demirören Holding-owned Milliyet would not touch such a daring project. Freely-available online and with little advertising, I’m not sure how T24 is actually funded (if anybody does, please do let me know), or whether it’s a viable long-term model for more serious journalism in Turkey, bypassing the established news organisations. Still, with mainstream media having so thoroughly discredited itself throughout the Gezi Park protests, the void will have to be filled by something if Turkey is to become more democratic. 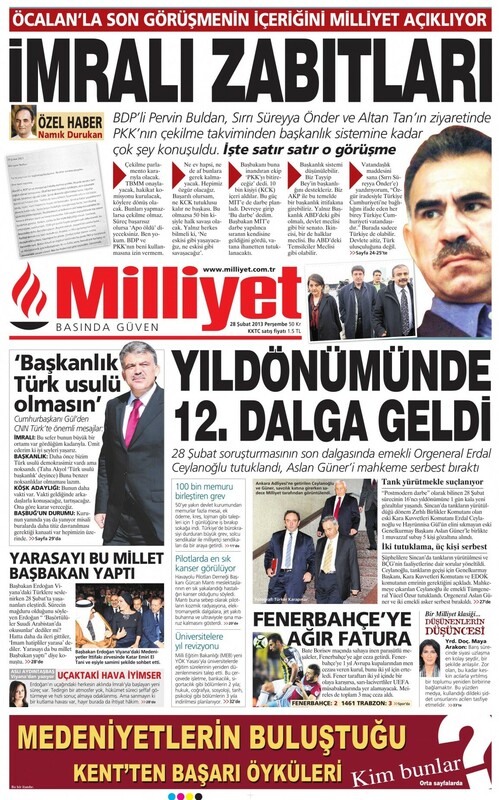 On Friday Dec. 14, news of resignations from daily Taraf filtered out, with editor-in-chief Ahmet Altan, assistant editor Yasemin Çongar, and columnists Murat Belge and Neşe Tüzel resigning from their posts at the paper. Founded in 2007, Taraf has become one of the most controversial and agenda-setting newspapers over the last five years. Originally set up by a group of like-minded liberals and leftists, the paper became renowned for its anti-military stance, publishing a series of highly-controversial stories that revealed the extent of the Turkish military’s involvement in daily political affairs. Taking on the once-mighty Turkish military saw Taraf regularly prefixed with adjectives like “plucky” and “brave,” and even lead to its accreditation from military press releases being cancelled. However, as question marks have steadily increased over the inconsistencies and judicial irregularities of anti-military crusades such as the Ergenekon and Balyoz cases, differences of opinion within Taraf have become increasingly evident. Altan’s editorials became increasingly critical of the Justice and Development Party (AKP) government, creating friction within the paper that I previously wrote about here and here. This divergence of opinion appears to be the main reason behind the latest resignations, with the more critical, anti-AKP voices having been purged, (it is strongly rumoured that they have gone – like many in other newspapers – following government pressure). Still, correct as Rodrik is, that doesn’t necessarily mean that the recent resignations don’t also represent “prime evidence of how much Turkey is slipping backwards,” as written by Yigil Schleifer – both can be true. If the past tense can really now be used to discuss Taraf, perhaps it can also finally be used to talk about any remnants of liberal Turkish sympathy for the AKP. With the passing of Taraf perhaps a chapter in Turkish politics also passes, and the last (much belated) nail can finally be hammered into the coffin of the 10-year-long flirtation between liberals and the AKP.